Risk Reduction is carried out throughout the project, in that efforts should be made at every stage to reduce the risks associated with any recognised hazard. This procedure focuses on risk reduction where Risk Evaluation (Procedure SMP07 – Risk and ALARP Evaluation) has shown that risks do not meet tolerability criteria, and therefore action is required. The preferred means of eliminating or reducing risk is through design rather than reliance on means such as training and procedures, warning notices or operational limitations for managing residual risks. This procedure covers the identification and selection of Risk Reduction options, as well as their implementation through changes to the design and the arrangements which will support it through life. Where Risk Evaluation indicates that a risk does not meet tolerability criteria, measures should be put in place to reduce the probability of the hazard resulting in an accident by breaking the accident sequence or reducing the consequences by controlling the accident that occurs. These measures should be recorded in the Hazard Log and arguments justifying the claim made in the Safety Case. The diagram below shows how Risk Reduction relates to other elements of Risk Management in the Safety Management System. Reduce the risk associated with the hazard or accident by implementing mitigation strategies based on human factors. The Project will demonstrate the effectiveness of the process for identifying and selecting mitigation strategies. In some cases the mitigation strategies will include new safety requirements (for example new protective functions to be designed in). The Project shall identify the safety requirements that realise the selected mitigation strategies, and ensure that where necessary these are incorporated into the overall safety requirements (see Procedure SMP10 – Safety Requirements and Contracts) and Through Life Management Plan where appropriate. The Project shall ensure that records are maintained to show traceability between hazards and accidents, and the associated safety requirements. If, after a risk has been reduced to a level that is ALARP, it is still unacceptable, the Team Leader shall advise the capability customer and equipment user that the department is taking on board residual risk that is greater than should be tolerated. Procedure SMP09 - Risk Acceptance defines the actions necessary for unacceptable risks. The Project Safety Manager will be responsible for the completion of the procedure. However, in most cases a large part of the detailed work will be carried out by contractors. The Project Safety Manager should monitor the scope and progress of this work. In large or complex projects, the Project Safety Manager must co-ordinate Risk Reduction across the project to ensure that a consistent and coherent approach to achieving and documenting Risk Reduction is adopted by all parties. The Project Safety Manager must also maintain the Project Risk Register up to date in respect of any emerging requirements for Risk Reduction activities, where these may affect project performance or costs. Risk Reduction will take place whenever Risk and ALARP Evaluation identifies an Accident whose risk is either not broadly acceptable or not tolerable and ALARP. Normally this will occur during Assessment, Demonstration or Manufacture, but it will also apply to new hazards identified in-service. Risk Reduction activities carried out by contractors will be reviewed by the Project Safety Manager. 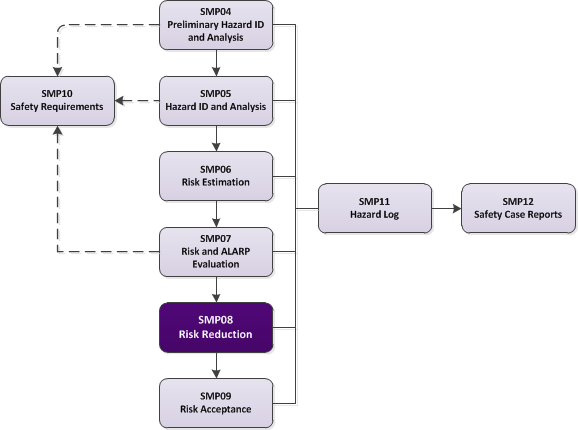 Outputs from Procedure SMP07 - Risk and ALARP Evaluation. The primary outputs of the Risk Reduction are changes to the system or the supporting Safety Management System which can reduce the risk of identified accidents. The process of Risk Reduction should be reviewed by stakeholders to identify, consider and implement, where necessary, options for reducing risk. The results of the review should be recorded in the Hazard Log. The identification of Risk Reduction options requires imaginative thinking which may best be conducted in “brainstorming” sessions for the stakeholders. A Risk Reduction checklist such as that provided under Further Guidance of this procedure may be used to guide the brainstorming. The process of Risk Reduction will be recorded through the Hazard Log. This will document in detail the audit trail of what Risk Reduction measures were considered and evidence of their implementation, or record the justification of why they were considered either not practicable or not reasonable to adopt. The Safety Case Report will summarise the Risk Reduction process and include evidence that the reduction has been effective in achieving the tolerability criteria. Also, the Safety Case Report should clearly identify any associated Residual Risks which are not considered to be ALARP. Incorporation of warning devices. Where it is not possible to apply one of the above methods, warning devices should be introduced. However, when assessing the revised predicted probabilities, the likelihood of human error in a stressful or unusual situation should be carefully considered. Due regard will be taken of human fallibility wherever a mitigation strategy is implemented through a human being. The failure rate apportioned to the human being in a particular situation should be based on actual experience of the same or similar tasks under the same or similar conditions where that exists. Any use of human failure rates should be supported by a demonstration of the validity of the rates being used. The selection or rejection of mitigation strategies is not a trivial activity. The Project should demonstrate in the Safety Case Report that all feasible mitigation strategies have been considered in sufficient detail to be able to make meaningful judgements about what is reasonably practicable. The Project should also demonstrate that mitigation strategies have been considered sufficiently early in the design process to allow the design to be modified. For any mitigation strategy that is employed, the effect on the system should be carefully considered. This should involve re-assessment to review the effect of the mitigation strategy on the system, to see if any new hazards have been introduced which require further examination, or if any existing hazards have been affected. Details of any new hazards or changes to the status of an existing hazard should be recorded in the Hazard Log. Should there be no apparent way of meeting the tolerability criteria, the Project Safety Manager should immediately be informed. If there are exceptional circumstances, the risk may be accepted in consultation with the relevant regulatory/certification authorities and/or senior management. Such events should be fully documented in the Hazard Log and Safety Case and justified in terms of the maintenance or optimisation of defence capability. See also responsibilities above. The key alignment opportunity in SMP08 should be to ensure wherever possible that Risk Reduction measures cover both safety and environmental control of common issues. The requirements for Risk Reduction do not change for acquisition conducted through intergovernmental agreements, OCCAR, multilateral or collaborative programmes. It is MOD policy that the same standards are met, and that assurance that these standards have been met should be demonstrated. Risk reduction strategies relying on warning signs or signals are unlikely to be sufficient for risks associated with high consequence accidents. Design solutions should take precedence. Once a Risk Reduction option has been identified and before it is implemented, it should be assessed to ensure that it does not introduce additional Hazards or increase the risks of existing hazards. After implementation, it will be monitored to ensure that it continues to be effective. If Risk Reduction is not considered sufficiently early in the project life cycle, certain options may be closed off. The cost of implementing design changes and impact on Project timescales become more and more significant. If the correct authorities are not consulted, then not all Risk Reduction options may be identified for consideration. Furthermore, the practicability and reasonableness of potential Risk Reduction options may not be judged correctly and an invalid ALARP argument or non-optimal safety may result. If potential Risk Reduction measures are not actively sought, then it will not be possible to claim ALARP, except on the basis of compliance with recognised good practice. The following paragraphs present a generic checklist for use in identifying options for reducing the risks associated with hazards and accidents relating to a system. Any such checklist should be used in a “brainstorming”, imaginative way to stimulate discussions between stakeholders who have a good understanding of the system, its context and usage/maintenance environment. Checklists application in a narrow way or by those with an incomplete appreciation of the system will be very much less effective. 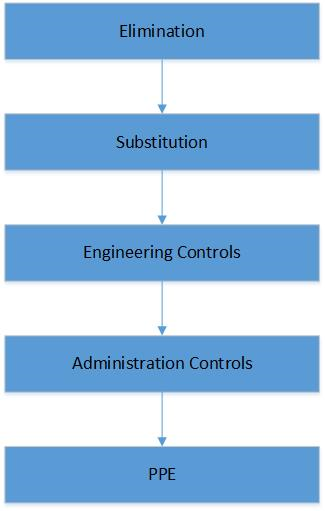 Mitigation strategies should follow the HSE Hierarchy of Control. This is represented in figure 8.1. Further detailed information can be found on the HSE website or BS OHSAS 18001:2007. Clear status visible on system components (e.g. valves). Improved design for Human Factors for human Safety functions. Defence in depth (including physical measures such as containment or bunds for leakage). Emergency exercises/drills to examine competence. Warnings in manuals and written instructions. Use standard notation and language for documented warnings.